Mahesh Pandit, an associate of Nityananda Prabhu, resembled Him in being extremely magnanimous and devoted to the salvation of all the fallen living beings. In his ecstasies of devotional love, he would dance madly. In Vraja, Mahesh Pandit is Kṛṣṇa’s cowherd friend, Mahābāhu. Mahesh Pandit is Mahabahu Sakha, one of the dvādaśa-gopāla, or twelve cowherd boys. His home (Sripat) was first situated in Masipur across the river from Jirat on the eastern bank of the Ganges. When Masipur fell into the river, the Sripat was moved to Beledanga near Sukhasagar. Here too, when the Sripat fell into the river it was moved, this time to its present location in Palpara. This last move took place in the Bengali year 1334, or 1927 AD. Palpara is situated within the Pāñcanagara administrative block. Śrīla Bhakti Siddhānta Sarasvatī Gosvāmī Ṭhākura mentions in his commentary to Chaitanya Charitamrita 1.11.32, that this final resting place for Mahesh Pandit’s Sripat is in Kanthal Puli near Chakdaha. Mahesh Pandit is considered to be a branch of both Nityananda Prabhu and Chaitanya Mahāprabhu. Some people say that he was the youngest brother of Jagadish Pandit, whose Sripat is in Jashṛa. According to this opinion, there were three brothers in the family, Jagadish, Hiranya and Mahesh. Mahesh Pandit’s Sripat is a small construction in the style of an ordinary residential building. It houses Gaura-Nityananda Prabhu deities, as well as Śrī Gopinath, Madanamohana, Radha Govinda and a Shalagrama Shila. In front of the temple building is a memorial to Mahesh Pandit, his puṣpa-samādhi. 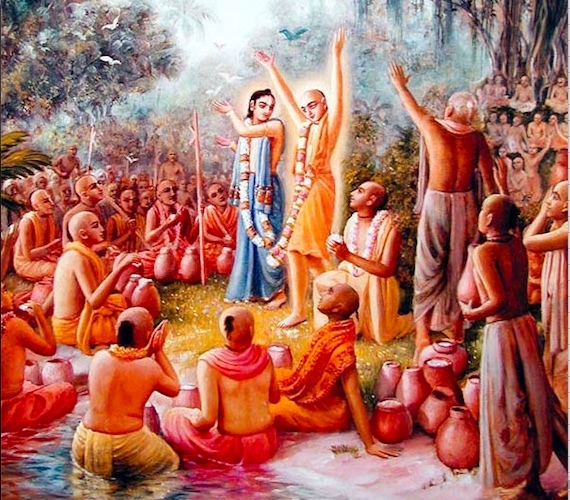 Śrī Mahesh Pandit participated in the Chira-dadhi Mahotsava (the festival of chipped rice and yogurt) in Panihati, after which he followed Nityananda Prabhu to Saptagram. He was present in Khardaha when Narottam Das Ṭhākura came there to pay a visit. With great affection, Mahesh Pandit bade farewell to Narottam Thakur and became in his separation (Bhakti ratnākara 8.220). Mahesh Pandit, an associate of Nityananda Prabhu, resembled Him in being extremely magnanimous and devoted to the salvation of all the fallen living beings. In his ecstasies of devotional love, he would dance madly. Mahesh Pandit was a magnanimous cowherd boy of Vraja. In his love for Kṛṣṇa, he would dance to the sound of kettledrums like a madman. His disappearance day is celebrated on the thirteenth day of the dark moon (kṛṣṇā trayodaśi) in the month of Paush.